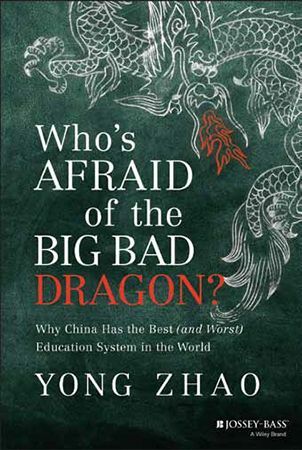 In the introduction to his new book, Who’s Afraid of the Big Bad Dragon?Why China Has the Best (and Worst) Education System in the World, Tech&Learning advisor Yong Zhao, Presidential Chair, Director of Institute of Global and Online Education, College of Education, University of Oregon, takes apart the current culture of assessment. In 2009, Dr. Beverly Hall, former superintendent of the Atlanta Public Schools, was named America’s National Superintendent of the Year for “representing the ‘best of the best’ in public school leadership.” Hall was hosted in the White House by Secretary of Education Arne Duncan. In 2010, the American Educational Research Association honored her with its Distinguished Community Service Award, which “recognizes exceptional contributions to advancing the use of education research and statistics.” Also in 2010, President Obama appointed Hall to the elite National Board for Education Sciences. In 2012, Lorenzo Garcia, former superintendent of the El Paso Independent School District in Texas, was sentenced to three and a half years in prison for “improving” his schools by preventing low-performing students from taking the state test. Garcia had been nominated twice for Texas Superintendent of the Year. Michelle Rhee, former chancellor of the Washington, D.C., public schools, was implicated in cheating scandals soon after the district’s dramatic improvement sent her to national stardom—with a prominent spot in the influential documentary “Waiting for Superman,” on the covers of Time and Newsweek, and backed with millions of dollars for her new organization, StudentsFirst. Cheating scandals have been discovered in almost every major school district that has reported great improvements—Houston, Los Angeles, Philadelphia, and New York. The most obvious victims are the hundreds of thousands of innocent children directly affected by the unethical, immoral, and illegal activities of the adults working in their school systems. But millions more are affected. What about those students, teachers, and school leaders who did not cheat and were adversely affected by their lower test scores? Even the instigators of these cheating scandals are victims. Sure, they may have been driven by greed for the cash prizes and promotions associated with improved test scores (or by the desire to avoid punishment for reporting poor test scores). But it’s unlikely that these people entered the education profession intending to hurt children for their own gains. The villain behind these cheating scandals is the accountability system itself, which is based on high-stakes testing. Ushered in by President George W. Bush’s No Child Left Behind Act in 2001 and reinforced by President Barack Obama’s Race to the Top initiative in 2009, test-based accountability that directly links student performance to educators’ livelihoods has become the yardstick of American education. By attaching lavish rewards and harsh punishment to student test scores, the system provides powerful incentives for cheating. Educators have far less control over student performance—and far less impact on its quality—than policy makers presume. And that’s especially true for teachers working in impoverished communities. When it comes to the harm done by high-stakes testing, rampant cheating is just the tip of the iceberg. As Sharon Nichols and David Berliner point out in their book, Collateral Damage: How High-Stakes Testing Corrupts America’s Schools, this “cooking of the books” is but one of many damages done by testing reported by parents, teachers, and researchers. Education historian Diane Ravitch warns in her book, The Death and Life of the Great American School System: How Testing and Choice Are Undermining Education, that high-stakes testing is one of the many symptoms of a virus threatening America’s future. That virus is the rising tide of authoritarianism in the United States. In exchange for the comfort of knowing how their children are doing academically and that their schools are being held accountable, Americans welcomed high-stakes testing into public education. Without the benefit of historical experience with these kinds of high-stakes tests, however, Americans failed to recognize those benign-looking tests as a Trojan horse— with a dangerous ghost inside. That ghost, authoritarianism, sees education as a way to instill in all students the same knowledge and skills deemed valuable by the authority. Despite cheating scandals and stressed-out students, America doesn’t seem ready to be rid of its villain. Many Americans still believe standardized tests are needed, and that problems like widespread cheating can be fixed through superficial means. Since the cheating scandals went public, most of the attention has gone to the crimes committed by a few individuals and the technical fixes that would have prevented them—everything from prescribing more severe punishments to increasing testing security and inventing better tests. Political leaders have pushed aside the call to abandon high-stakes testing altogether. Secretary of Education Arne Duncan said that while he was “stunned” by the Atlanta cheating scandal, the problem “is an easy one to fix, with better test security.” Most parents support standardized testing and the use of test scores in teacher evaluation. Even some educators and school leaders support standardized testing. The two largest education unions, the American Federation of Teachers and the National Education Association, both accept standardized testing as part of American education. Herein lies the tragedy for America—and the reason for my writing this book. The tale told by Chinese education illustrates the full range of tragic events that can happen under authoritarian rule. As one of the perfect incarnations of authoritarian education, China has produced superior test takers who have maintained a great civilization for millennia— but failed to cultivate talents to defend against Western aggressions backed by modern technology and sciences in the 1800s. Since then, China has struggled to retreat from its tradition of authoritarian education. Although China has already benefited from a gradual withdrawal from central dictation, as evidenced by its recent miraculous economic growth, authoritarianism still rules.